I mentioned in one of the earlier breaks that I am trying to incorporate more recent packs and more of the same packs (that is, doing things to encourage duplication). Well, I don't think I've opened one of these yet, but it is (sorta) recent. 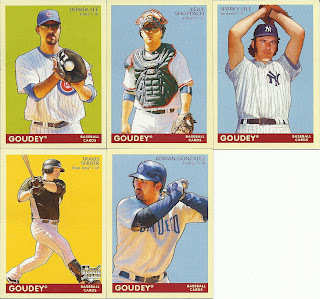 Today, I grabbed a pack of 2009 Goudey. Kelly Shoppach - Indians - WAHOO!! Wow, that is awesome! Wow, a Triber in a pack of five cards. Sweet! I did a quick check and I already have it. Timothy, it's all yours, man. As it turns out, these all have some creasing. The hazards of repacks, I guess. Bummer.